As a parent, I take my daughter's education seriously. I want to give her the tools to succeed. Whether it's teaching her good study skills, or using online resources like K5 Learning. 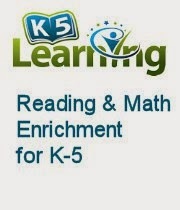 K5 Learning is an online reading and math program for kids from kindergarten through grade 5. Their intent is to help kids build reading, math and study skills through independent study. K5 is designed for use at home, after-school, on weekends and during the summer, and can also be used in conjunction with a homeschooling program. I'll be taking part in a 6 week free trial to test and write a review of their program. If you are a blogger, you may want to check out their open invitation to write an online learning review of their program.